even one's own relations.” Oscar Wilde, A Woman of No Importance. Coating can be simply restored at home, time after time . Heat a large pan full of salted water and chuck in as much pasta as you can eat. Leave it cooking while you get on with the rest of this. Warm over a moderate heat. Add the onions and cook until soft and translucent, then add the cauliflower. Continue cooking until the cauliflower starts to take on a little colour. Add the raisins and 1 tablespoon of the pasta cooking water. Cook for 5 minutes to allow the raisins to plump up and the liquid evaporate. Add the hazelnuts and cook for another 2-3 minutes. 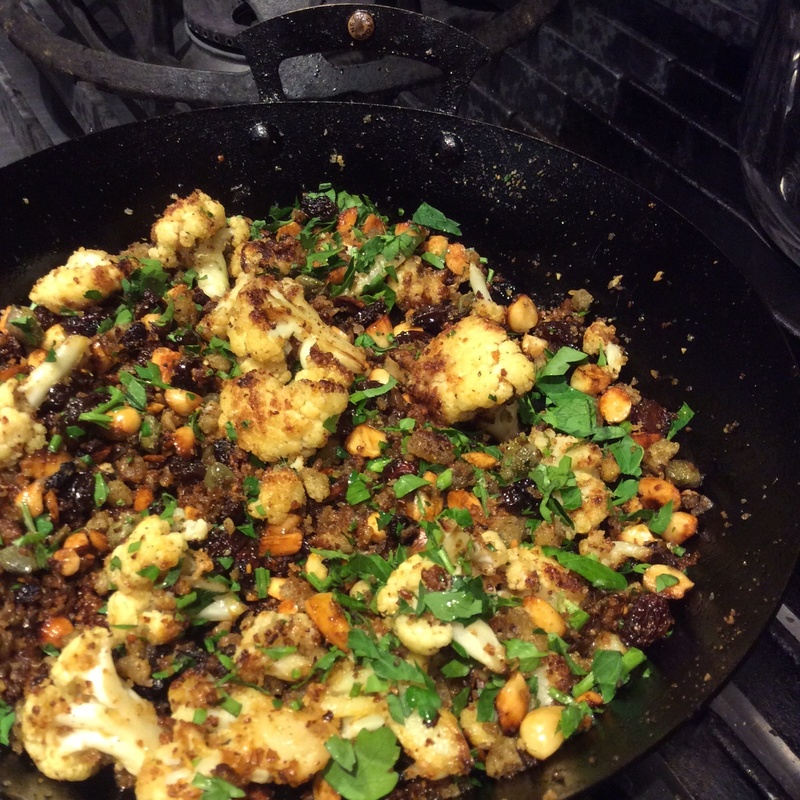 Stir into the cauliflower mix along with the capers. Scatter the parsley, Parmesan and breadcrumbs over the top and eat immediately. I noticed we had some slightly wrinkly apples in the fruit bowl, bought in expectation and abandonned when their taste did not match their looks. Pour 250ml full fat milk into a saucepan and add 4 cloves. Bring to the boil, turn off the heat and leave for an hour for the flavour of the cloves to infuse into the milk. Take 4 apples, peel core and quarter. Melt 50g butter in a 10" prospector pan over a low heat and then add 120g sugar. Cook continuously until it turns golden brown. 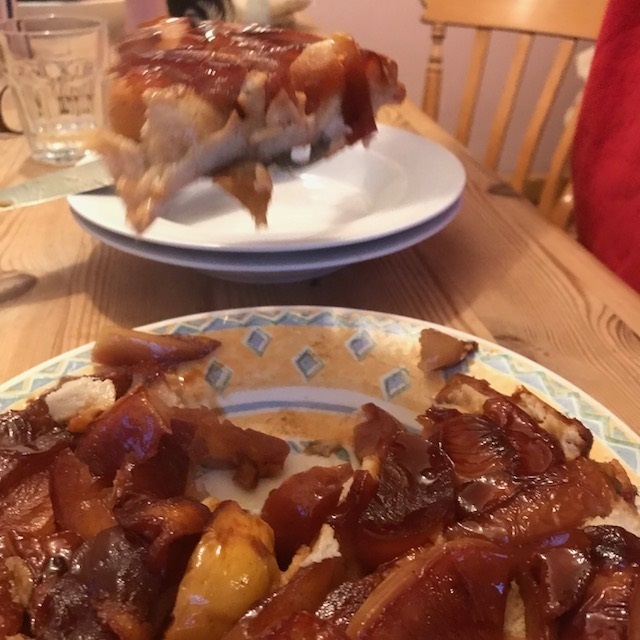 Add the apple slices, cover and cook for 10 minutes until the apples have softened and taken on some of the caramel colour. Remove the lid and increase the heat. Cook until the caramel has turned a rich mahogany and most of the juice has evaporated. Remove the cloves from the milk and return the pan to the hob. Heat gently. Beat in 50g buckwheat flour, a teaspoon of vanilla extract and 100g sugar. Add 2 beaten eggs and mix vigorously. Pour over the apples and pop it into the oven. Cook for 20 - 25 minutes until the top is firm. Remove from the oven and leave to stand for 10 minutes. Invert on to a serving plate and serve with clotted cream. NB because I have used buckwheat flour, this pudding is gluten free. 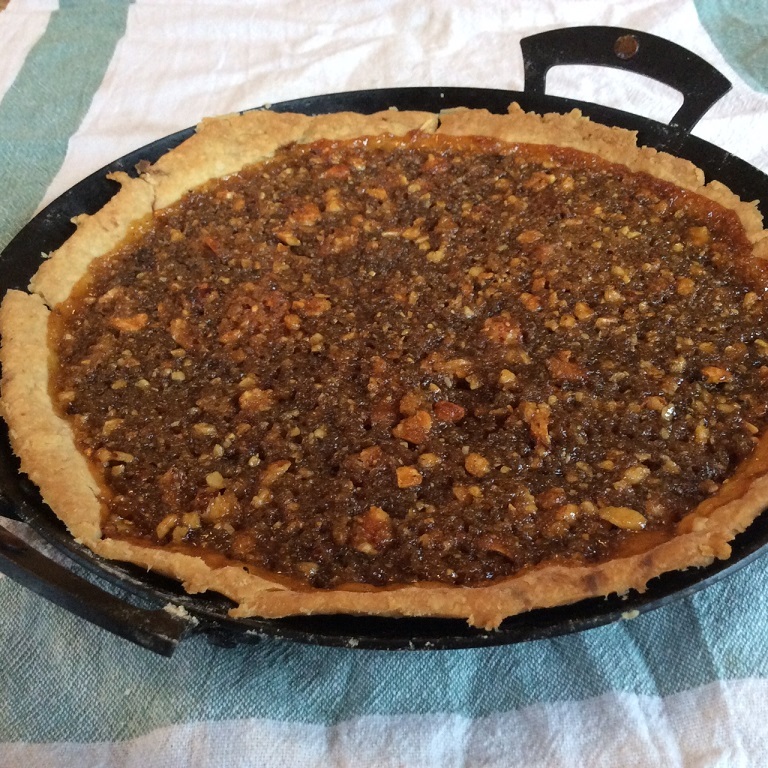 A little of this treacle and nut tart is all you need to feel good; it contains gluten, dairy, nuts and a ton of calories and boy, do they taste good! Felicity Cloake has written rapturously and with far more research than me on this topic and her recipe does sound delicious. It is not an everyday dessert and it is also old fashioned; one of those nostalgic memories of puddings past that people like Jeremy Lee and Fergus Henderson have been reviving - as seen mentioned in this month's BBC Good Food magazine. But every once in a while, this gooey, sweet delight will stick crumbs and smiles to your lips. Start by making some shortcrust pastry with 120g plain flour and 60g butter. Roll out and line a 10¼" shallow prospector pan. Put the pan into the pre-heated oven and cook the pastry case for no more than 10 minutes. Coarsely chop 50g of mixed nuts (or just use your favourite). Weigh out 80g of sourdough bread, crusts removed, and process into crumbs. Put 300g of golden syrup in a large saucepan and heat gently until runny. Stir in the breadcrumbs, nuts and orange zest and mix thoroughly. Pour this mixture into the pastry case and spread evenly. Put the pan back into the oven and bake for 20 minutes. When you remove the tart from the oven, the filling will be bubbling like lava on the rim of Vesuvius, so take care. Allow to cool and serve at room temperature with custard or clotted cream. We saw this instagram conversation in June 2018 between food writer Ed Smith and a few food enthusiasts on his very popular Rocket and Squash account. We thought it was well worth preserving for posterity as it's a great way to produce a "nearly" wood fired pizza. We reckon he was using and 8 inch oven safe frying pan but a 8 inch prospector pan would work equally well. rocketandsquash??? ?per cent I'd like to have a wood fired oven (and a garden to put it in...). But for now my hack of @nethertonfoundry frying pan and oven at full whack is going ok ???????? Oven on at the very hottest it can go (mine is 275 fan). Cast iron (well, spun iron) pan on v hot hob for a minute or 2 until nearly smoking; dough stretched out and onto it. Add tomato base and anything else. After about 90 seconds, into the oven for another 2 minutes or so. ???????? bethfrombristol@rocketandsquashBrilliant, thank you.. 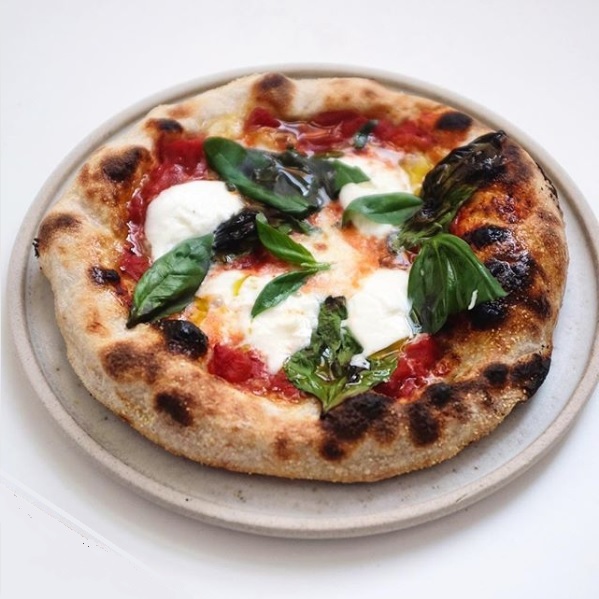 I need to invest in the pan, I love the taste of wood fired oven pizzas!! rocketandsquash@zia_gi_nav this was (from memory because it was derivative of other bread making): c.150g of a levain (sourdough starter plus equal parts flour and water), about 200g strong white bread flour, 175g water, 5g salt. Chucked if around a few times over 4 hours last night. Left in fridge until midday today. Split in two, shaped, back in fridge until 7pm, then stretched and cooked. Basically, much less cared for than my loaves, but worked really well. hannah_friendlyI love a bit of frying pan and then grill! Good enough until I can fit a wood fired oven outside ???? 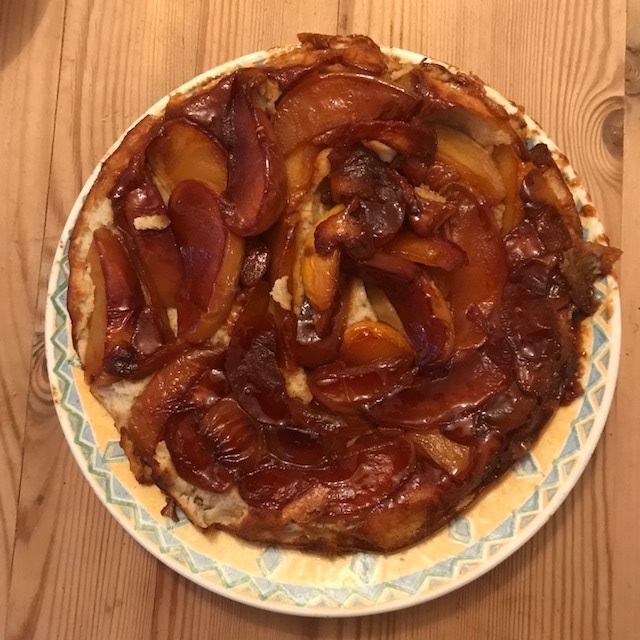 food_writerWow - that’s a massive result! the depth and richness of kid meat creates a dish that is one of the greats of world food. Mix together the shanks, tomatoes, onions, garlic, melted butter, spices (apart from the saffron), 1 teaspoon salt and ½ teaspoon pepper. Cover and refrigerate for a few hours or overnight. When ready to cook, put the marinated meat in a large saucepan and cook, uncovered, over a moderate heat for 20 minutes until a sauce has formed and thickened. and simmer gently over a low heat for about 2 hours or until the meat is completely tender. Top with a little water if it dries out. When the shanks are cooked, remove any excess fat from the sauce and add the pistachios, then the honey with salt and pepper to taste. Serve scattered with the coriander and mint leaves. 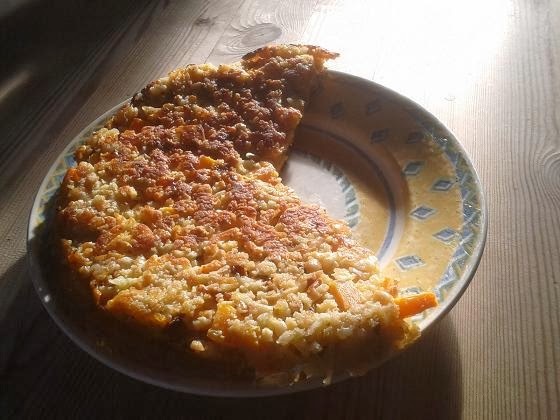 James used a Netherton Foundry 10 inch Prosector Casserole to make this dish, click here for more details of the pan. 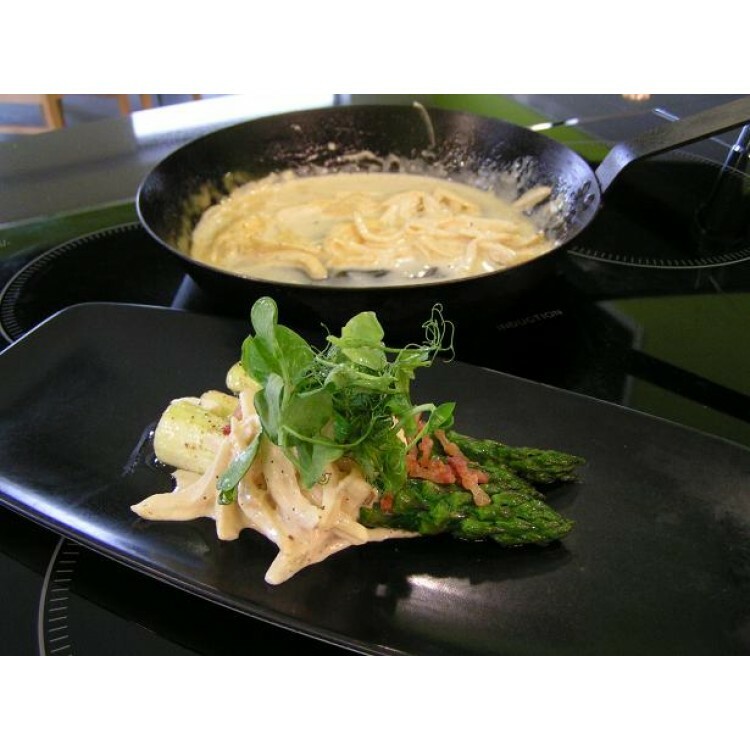 Place a Netherton Foundry crepe pan on the hob and gently heat 1 tblsp oil. Fry onion and squash until soft. Remove from heat. Place all the other ingredients into a mixing bowl, then add the onions and squash. Season to taste - Halloumi is quite a salty cheese and if you are also using salted cashews, make sure you taste the mixture before adding additional salt. A handful of chopped fresh herbs will give this dish some extra zing - try parsley, thyme or mint. Replace the crepe pan on the hob, add 1 tblsp oil and turn the heat to medium. Add all of the mixture to the pan and spread out evenly. Press down with the back of a wooden spoon. Cook for around 7 minutes until the underside is browned and the "cake" holds together. Place a large plate or serving board over the pan, invert and turn out the cake. Slide back into the pan, cooked side upper most. Continue cooking for another 7-10 minutes until the underside is cooked..
Slide out onto a plate and cut into slices. Serve with greens, tomato sauce and, if you fancy, real chips! A tasty little treat which makes a change from beef burgers. 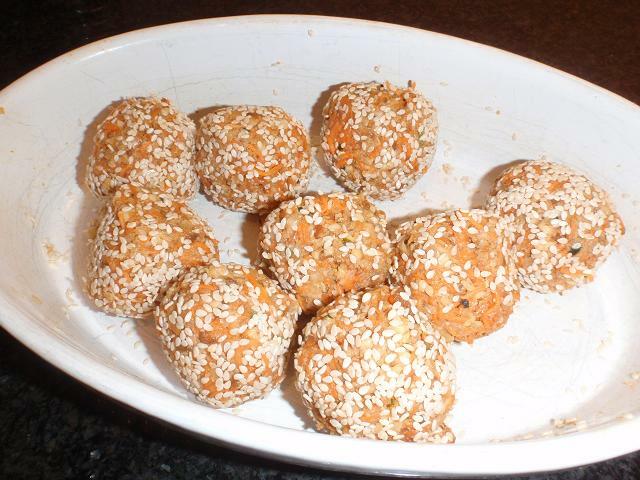 These are great served as burgers in a roll with ketchup, but equally good made into little balls & served cold in pitta bread with salad and a yogurt and mint dip. 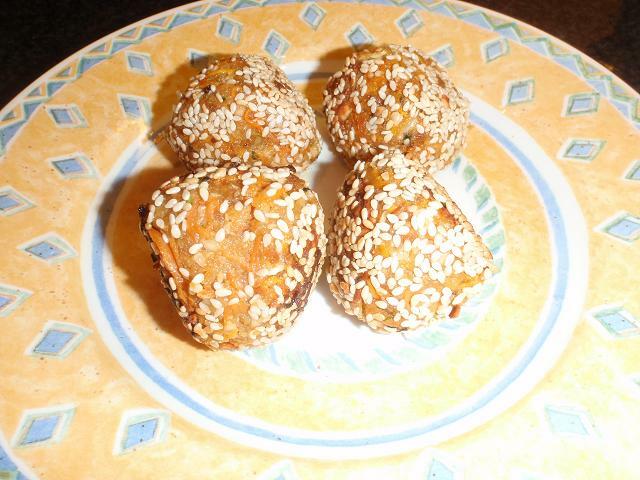 Mix together all the ingredients except the sesame seeds. Mould into 12 burgers and roll in sesame seeds. Heat the oil over a medium heat in a Netherton foundry 12" frying pan, this will accommodate all of them, otherwise do them in batches and keep warm. Fry until brown and crispy and warmed right through. 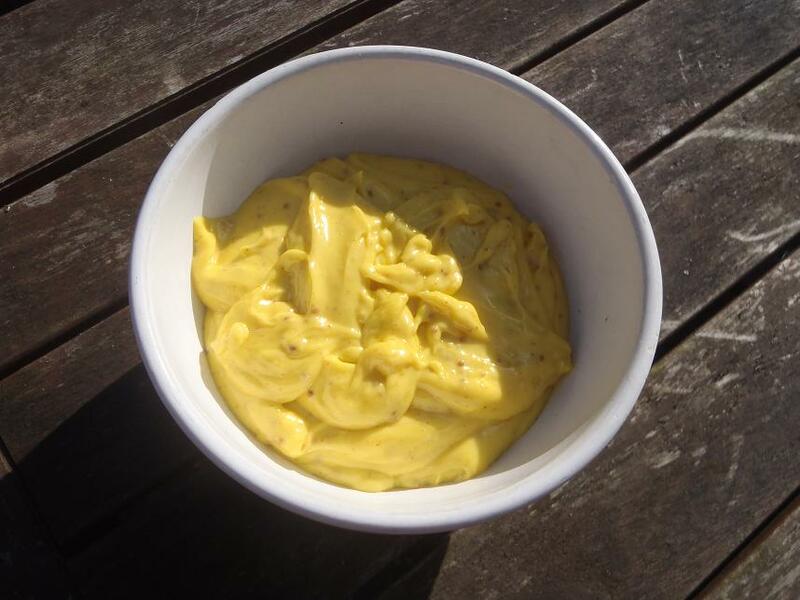 Not only good with yougurt, but also mango chutney, ketchup or mayonnaise. This is a short video from our friend Phil Leverington, aka the Demo Chef. Phil prepares and cooks pan seared pork on a bed of leeks and black pudding using just one knife, one pan and one dish ! 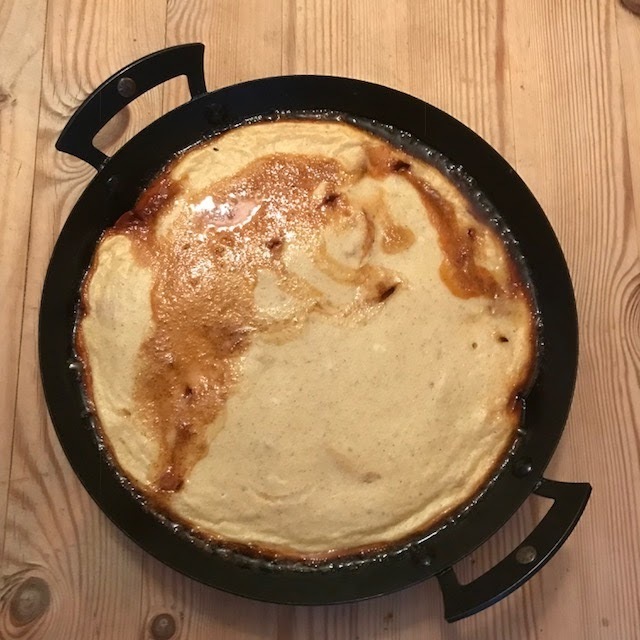 Netherton Foundry 10" Oven Safe Crepe Pan. She tells us that this is a family favourite and lovely served with a green salad. Chop mushrooms and leeks and simmer in a vegetable stock for 5 minutes to soften. Drain off and keep 150ml of the stock. Put the 150ml of the stock back on the heat and add 1 tbsp of balsamic vinegar, 1 tblsp of whole grain mustard and 2 tblsp of creme fraiche. Stir until warm but do not let it boil. Stir in finely chopped parsley and the drained leeks and mushrooms to warm through. Pour into the pancakes and fold. Serve immediately with a crisp salad for a perfect lunchtime treat. Hint:- The pancakes will turn out better if you make the batter at least one hour before cooking and refrigerate it. Sift together the flour, baking powder and salt. Beat together the eggs and milk and stir into the flour mixture. Add the water and beat the mixture until it has the consistency of thin cream. Pour in the brandy (or lemon juice) and cooking oil and stir thoroughly. Cook the pancakes in a greased, heavy-based frying pan or preferably a Netherton Foundry 10" oven safe crepe pan. To make the sauce heat together the tangerine flavoured liqueur, butter, brown sugar, cinnamon and lemon rind stirring until the butter has melted and the sugar dissolved. Add the bananas and simmer for a few minutes. Place a banana half on each pancake and roll up. Place in a serving dish and pour the remaining sauce over. Serve each pancake with a slice of lemon. This is not authentic, it is just a delicious combination of ingredients, inspired by the tastes of the Middle East, which I hope you will enjoy as much as we did. We ate this with slices of bread, drizzled with Bennett and Dunn rapeseed oil, sprinkled with home made za'atar and then baked until crisp on our griddle plate in a hot oven. 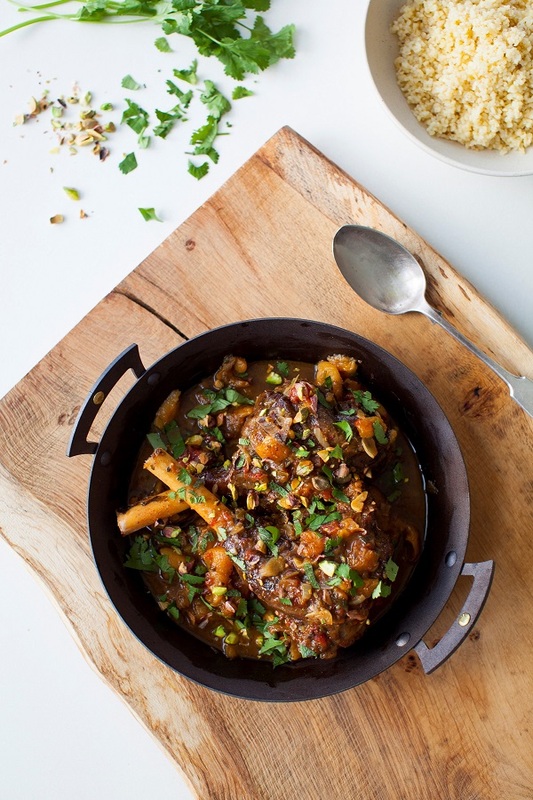 It would be equally good with a flatbread and of course, whilst it makes a great vegetarian main dish, it would also be good with lamb chops! 150g butter beans, soaked overnight, simmered until soft in fresh water. Heat the oil over a medium heat in a Prospector pan and add the onion, garlic and aubergine. Cover with a lid and cook slowly until the whole lot is soft. This should take around 20 minutes. Add the beans, tomatoes, cinnamon and salt, pop the lid back on and cook for 30 minutes. Remove from the heat and stir in the lemon juice and mint. Either serve immediately or allow to cool to room temperature. This is a short video from our favorite Demo Chef Phil Leverington, prepares and cooks Venison with cabbage and black pudding on an outdoor wood fired Frontier Stove using just one knife, one pan and one dish !